Meet your fitness goals: Use your Google Home to play your workout playlist,, set alarms for working out, or cast workout videos from YouTube to your TV with Google Home and Chromecast. Get better sleep: Tune out noises from the apartment next door or help get your kids to bed by saying, “Hey Google, play white noise.” You can also set reminders to help you stick to a consistent bedtime. 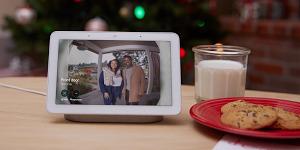 Limit screen time: With more than 50 games and activities for families, the Assistant on Google Home can provide more fun for the family without TV, tablets or phones. And when it’s game time, you can broadcast the message to all Google Home devices in your house. Thanks to my Assistant on Google Home, 2018 is the year I’m actually sticking to my resolution.